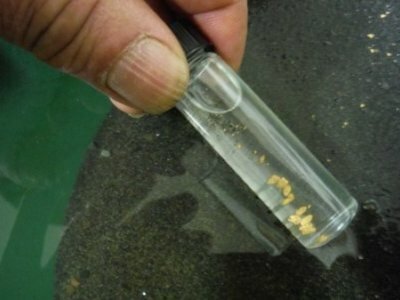 We have developed a new way to mine surface gold deposits! 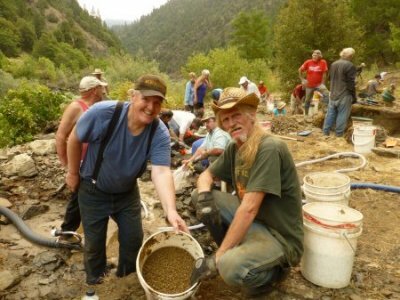 This story actually began early this season when we discovered a high-grade gold deposit on the far side of the river along one of our newer mining properties about nine miles downstream from Happy Camp. The property is numbered K-23AA on our Claims Guide. The upper end of this property has a gravel bar that is down closer to the Klamath River. Then there is a gradual slope that rises around 15 feet in elevation to a sizable plateau. We assumed there was an older streambed on the plateau. 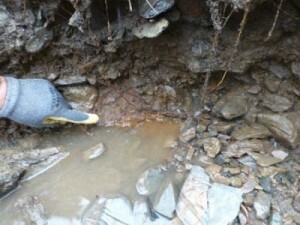 But since we made our gold discovery on the slope, we didn’t initially invest much time up there. The slope was quite easy to mine because the gold was broadly concentrated in a thin layer of compacted sand on top of shale bedrock. Full pan samples of the compacted sand, and even the decomposing shale bedrock, could produce more than a hundred colors, sometimes more than 200 colors. Most of the colors were fine gold. But they added up nicely when the material was processed in volume. So we organized the first three Weekend Group Mining Projects of this season to sampling and processing pay-dirt on the slope. Those projects produced excellent results. And there still remains a lot of the slope that has not been touched. All experienced gold prospectors will tell you that there are these occasional moments of important discovery that change everything. That happened when we first located the pay-dirt on the slope. At that very moment, everyone on our sampling team knew we were going to pull one of our big rubber rafts out of mothballs and use it to support our weekend projects this season on K-23AA. It was a magical moment that changed much of what we would do this season. 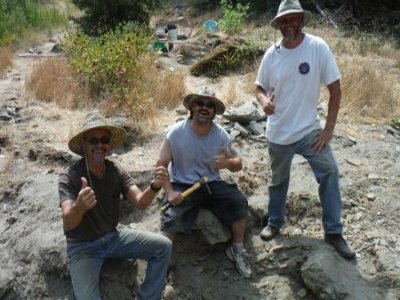 We started calling these guys the “Alpha Team” after they moved some boulders and uncovered the ancient streambed material that is under their feet. 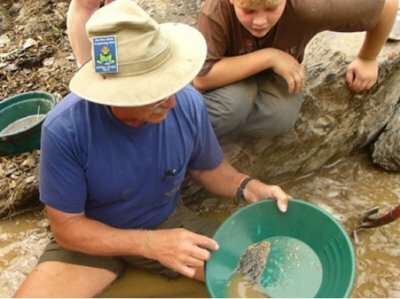 Important gold discoveries change everything! This happened again during our third weekend project when several participants decided to move a few boulders up on the plateau to see if they could find any gold underneath them. The rocks were rather large, so I lent them a 5-foot pry-bar. 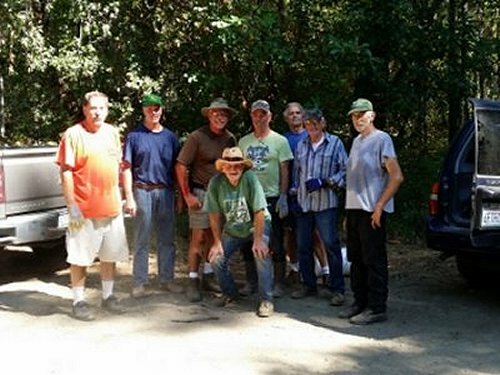 What we found under the boulders was a layer of orange original Klamath River streambed. Surprise, surprise! This was hard-packed streambed material that had been left behind by earlier generations of gold miners. Perhaps there was a mining camp or someone’s residence on the plateau during the early days; maybe a recovery system where the old-timers were processing pay-dirt. Who knows? For whatever the reason, they did not mine this area. This was a stroke of luck for us! 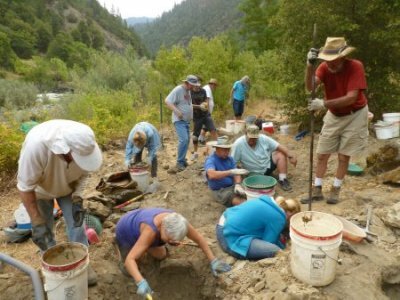 There have only been a few occasions during my 35 years on the Klamath River where I have uncovered original streambed in the surface deposits alongside the river. Most of the time, the surface deposits are made up of a more recent streambed that was laid down after the old-timers mined the original deposits; perhaps from the 1964 flood. There is plenty of gold in these more recent streambeds. But the original deposits paid much better the few times we found them. Original streambed on bedrock. Now that’s what I’m talking about! 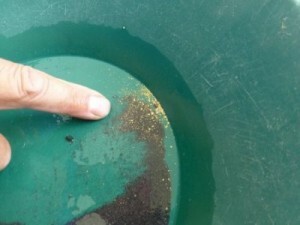 Gold from a single pan out of the orange material! This story gets better. But only because of the loyal support and enthusiastic participation of longtime New 49’er members, Rich Krimm, John Rose, Ray Derek, Derek Eimer, Mark Turner and Diane Helgesen. The bunch of us went across the river on three separate occasions to set up this gear and get it dialed in. 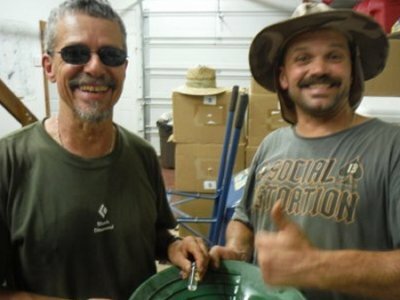 I especially want to acknowledge longtime member, Gary Wright, who devoted numerous late hours in our workshop helping to fabricate, and refabricate, the components which made this all possible. Prototyping new ideas requires a lot of time and effort! The components have actually turned out to be quite simple now that we have worked it out. Just as we thought, the modified nozzle was easier to manage. So that’s what we decided to use for our Weekend Project the following weekend. We split all the gold we recover evenly amongst all the participants during our group mining projects. Therefore we were a bit alarmed when the signups jumped from 40 to 76 people in just the day or so before the project started. Normally, for that many people, we would set up four high-bankers to process pay-dirt. But it was too late for us to set up any more of these gravity mining systems. It takes a lot of gold to satisfy 70 people! What to do; what to do? We finally decided to move ahead with our two gravity mining systems hoping that the richer material on the plateau in combination with our new, more efficient, method of mining would save the day. I am the one who splits the gold into shares at the end of our projects. Since I prefer to make people happy, I don’t think there has ever been one of these events that I was not nervous about recovering enough gold, or perhaps getting skunked altogether. This brings to mind projects during earlier years when the individual shares were so small; you had to look close just to see the gold each person got. Members were always nice about it, agreeing that the learning and experience were worth more than the gold. And that’s true! But when you go out there in the mud and the dirt, sweating under the hot sun, it’s a heck of a lot better if you walk away with something valuable to show for it! Through a little trial and error, the guys in the hole worked out a system of using the pumped water to help wash streambed material around in the hole. We have talked about this method of “blow mining” in an earlier newsletter. Others were using the syphon nozzles to drain water and material out of the hole. Their biggest challenge was mainly removing rocks that were too large to pass through the nozzles. This is like a remote high-banker feed! Oh my; that's a lot more gold! This is just from one of the feeders! We are seeing flakes in the material! Several hours later, we were all back across the river and at the Grange Hall in Happy Camp doing our final gold clean-up and gold split. There was so much excitement and chatter going on; Rich had to keep reminding everyone that I was still in the teaching mode. 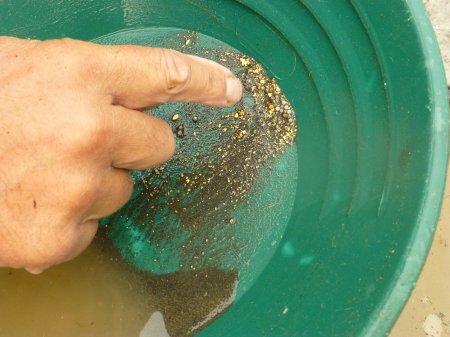 It’s valuable to know how to do the final gold clean-up steps! A bunch of the participants were just too jacked-up to watch. 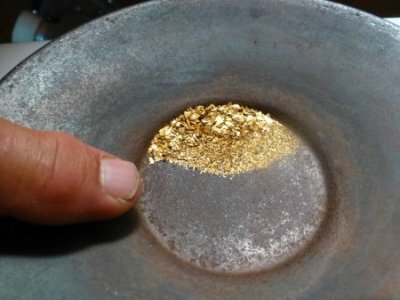 In the end, we recovered 10.4 pennyweights of beautiful gold from about four hours of hard work up there on the plateau. That’s a little more than a half ounce; a seasonal record for this year. There were 21 nice nuggets, the largest being 8 grains. That’s pretty big! We split the gold amongst 64 very happy members. All of our team helpers agreed this was the most successful and fun project we have done in years. In addition to having a good day, we accomplished two important things: We have developed a whole new way of surface mining that allows us to get more accomplished for our effort. 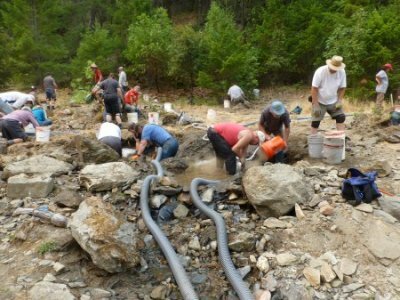 This is being called, “gravity mining.” Through all the effort we invested up on the plateau on upper K-23AA, we have also discovered that the original Klamath River streambed (orange hard-packed material) is quite extensive up there. Like I said, that discovery changed everything. It means we will be going back for more! Join us for our Final Weekend Group Mining Project of This Season! 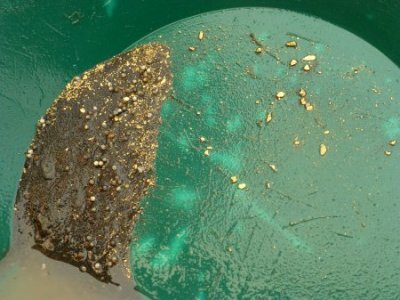 There is a learning curve to successful gold prospecting. One of the most effective methods of progressing through the learning curve is to go on prospecting adventures with others who more experienced than you are. 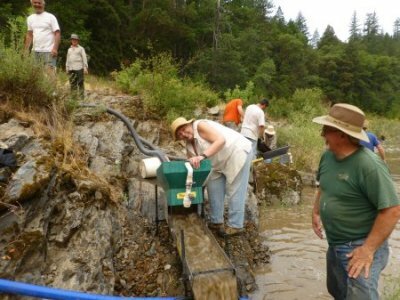 Our 2-day Group Mining Projects are one of the primary benefits of New 49’er membership which set us apart from other mining associations. The remaining weekend event for the 2014 season will take place on August 23 & 24. These events are free to all members. Everyone is invited and encouraged to attend. We appreciate it if you contact our office in advance to let you know that you will attend: 530 493-2012. 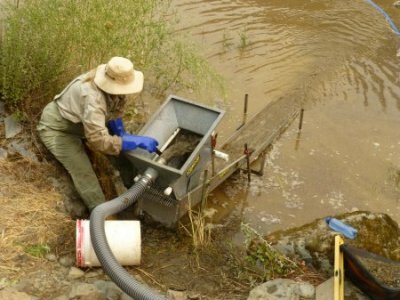 Please refer to last month’s newsletter for a comprehensive update on our efforts to get suction dredging opened back up in California. We have strong hopes that it will happen in time for the 2015 season. Rich Krimm and I are scheduled to accompany our attorney to San Bernardino to participate in Mandatory Settlement Discussions on the fourth and fifth of September. Superior Court Judge Ochoa has made it clear that he believes there is a chance he can help resolve the outstanding issues between all the parties and settle on reasonable suction dredge regulations for California. Please watch for an update in our September newsletter. 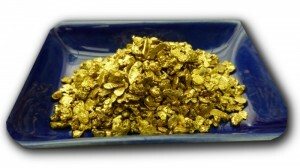 On the subject of legal, to encourage more participation in legal fund-raising, I have authorized three ounces of my own gold nuggets to be split up into 25 prizes that will be drawn on the 31st of October (Halloween). Check out the gold by clicking here! We bill $50 for annual dues to all Full Members in August. This is because most of the costs, especially property taxes, that are associated with maintaining our extensive mining properties come due before September. The Bureau of Land Management in recent years has substantially increased annual filing fees to hold mining properties. We thank you in advance for your support on this! Thank you very much to those of you who sent in applications for this position. This is to let you know that we have hired someone. I have placed all of the applications on file in case another position becomes available. Thanks also to those of you who expressed interest in our caretaker opening. This position has also been filled. We need to give a big “thank you” to Rich Krimm and his team of helpers who devoted a half day on K-15A filling in holes that others left behind. We strongly encourage you to sign up for the free on line version of this newsletter. The Internet version is better. This is because you can immediately click directly to many of the subjects which we discuss; because the on line version is in full color; because we link you directly to locations through GPS and Google Earth technology; and because you can watch the free video segments which we incorporate into our stories. Actually, the video segments show the adventures better than I can write them! Signing up also places you on our Political Action Team. Things happen so fast these days; it takes too long to organize political action through the U.S. mail. As an example, just a few years ago, in concert with other mining organizations, our Internet Action Team killed anti-mining legislation in Oregon in less than a week. All of these future battles will be organized over the Internet since it is so much faster. Please join us in the battle to maintain our remaining freedoms!